UB neuropsychologist Ralph H. Benedict has been selected by the International Neuropsychological Society (INS) as the recipient of its 2016 INS Mid-Career Award. As the recipient of the award, Benedict will give an invited lecture on “The Evolving Role of Neuropsychological Investigations in Multiple Sclerosis” at the INS annual meeting to be held in Boston in February. 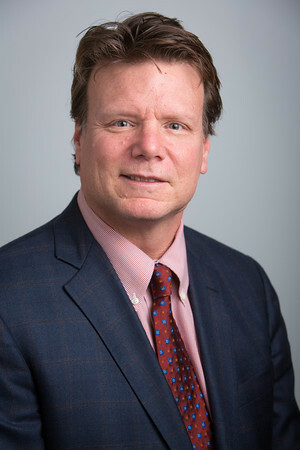 A professor of neurology in the Jacobs School of Medicine and Biomedical Sciences, Benedict is internationally recognized for his influential research on the psychological, behavioral and cognitive effects of multiple sclerosis (MS). He also conducts research on geriatric psychiatry topics, including Alzheimer’s disease. In 2004 and 2005, Benedict and colleagues published landmark studies that were the first to show deep gray matter atrophy is the primary driver of cognitive impairment in MS; the studies also showed cognitive dysfunction is the most important predictor of vocational disability in MS patients. The research challenged the conventional thinking about MS and is changing the way clinicians and researchers approach the disease. A UB faculty member since 1992, Benedicts directs a UBMD outpatient neuropsychology practice at Buffalo General Medical Center and an inpatient consultation service at Erie County Medical Center. He also sees patients at the UB Alzheimer’s Disease and Memory Disorders Center, where he co-directs a multidisciplinary case conference. Benedict is a consultant to the National Hockey League and the National Football League for neuropsychological consultations in cases of head trauma. Memory tests that he developed are now widely used to assess patients with MS, head injury or schizophrenia; they also are used by the NHL and NFL. A recipient of the SUNY Chancellor’s Award for Excellence in Scholarship and Creative Activities in 2015, Benedict is a fellow of the American Psychological Association. He also won the Stephen Kelly Award for MS Research of the Western New York Chapter of the National MS Society in 2013. He has more than 200 peer-reviewed publications, many of which have been cited more than 100 times, and more than $2 million in funding, primarily from the National MS Society and the pharmaceutical industry. He has served on the editorial boards of BMC Neurology, the International Journal of MS Care, the MS Journal and Neuropsychology, and on the grant review committee of the National MS Society. Benedict did a postdoctoral fellowship and residency at the Johns Hopkins School of Medicine. He earned his doctorate from Arizona State University and his bachelor’s degree from Ohio State University.